The “Catacomb librarian” over at Mesmerized by sirens called for blog posts in appreciation of pre-1990 FRPGs, and I think that’s a very worthy idea. I was pretty sure I’d find something in my book shelves that would fit the bill, but there’s a bit of history. You see, when my brother & I got into gaming, we had fairly different interests in terms of what we bought. Tom loves collecting and reading rules sets, and if he had a blog (and the time) he could probably mention an obscure RPG for every day of the month. I on the other hand was mostly into the miniatures from the start. At some point, probably when we were in high school or college, we agreed to split up everything so that Tom kept all the books and I kept all the minis. Literally the only gaming books I had for years were war games rules and other miniatures-related books, although I broke down and picked up my own copies of a few books (GURPS stuff, a few AD&D manuals, and that sort of thing). About five years ago I began collecting old RPG material and have amassed a decent collection of basic and advanced D&D books and magazines, and even some modules, mixed in with some stuff I’ve borrowed from Tom for the campaign I’m running. Going back to the pre-1990 days, apart from GURPS there were only two RPGs I bought: Man-to-Man and Valley of the Pharaohs. 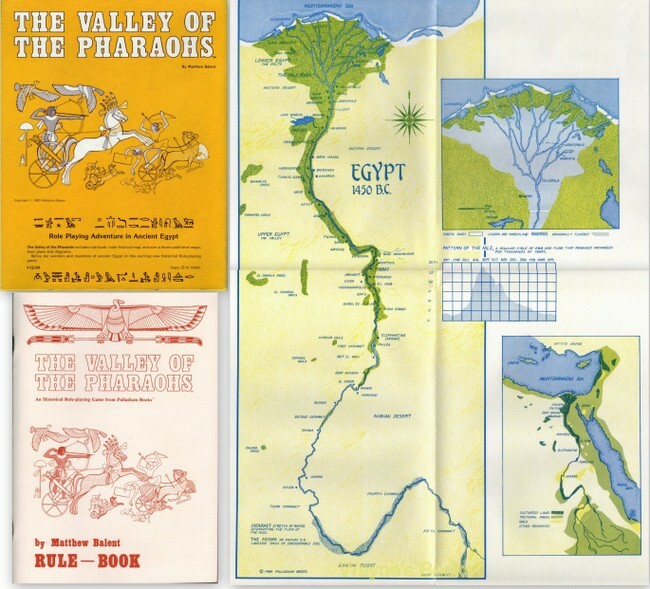 Valley of the Pharaohs was advertised pretty heavily in Dragon Magazine in 1983 or so, when it was first published, so I think many older gamers have seen the cover even if they never played it. It quietly went out of print in 1985, and I’ve never so much as seen a review of this game. My copy of Valley of the Pharaohs disappeared back when I was in college. I never even realized that my copy — bought second-hand at a convention, I believe — was incomplete until a couple of years ago when I discovered it was supposed to have more than the booklet and a single map. Apparently there were more maps, character sheets, and maybe some reference sheets in the boxed set. VotP was published by Palladium, and the book was about the size of one of their “Arms & Armor” books. The rules were not the ones that would later be published as the Palladium FRPG and later Palladium games, but there are similarities. The combat system was fairly similar, with dodging and parrying as rolls, and the damage listed for weapons was similar to PFRPG too. There were four castes (Nobility, Clergy, Bureaucracts, Commoners) and the attributes were pretty close to the typical “D&D heart-breaker” — in this case Strength, Speed, Intellect, Power, and Persona. You rolled for caste and attributes but could pick a profession (Soldier, Priest, Scholar, Merchant, and Thief were the only ones), then you got skills based on occupation, with some choices…it is a big list, taking up 1/2 the character sheet. The best thing about it was they stole a page from Chaosium and rather than having levels, you increased or gained skills by using them or training. The magic system was sort of brief and listed 20 or so generic spells and a nice list of magical amulets, statues, and paintings which are clearly based on Egyptian beliefs. Spell casters have a “magick” skill used to cast spells, and each spell must be learned separately. Spellcasting also uses magic points, so it was quite a departure from the magic systems in D&D and PFRPG. When I first read it, I found that my knowledge on Egypt was pretty shaky and the world of ancient Egypt too alien. Aside from an overview of Egyptian society with too much focus on the royalty, burial practices, and gods (really — that’s all stuff you can find in any book), there were about seven pages of “G.M. Notes” and much of that is taken up by equipment lists, a list of the nomes of ancient Egypt (which is already on the map), and nearly a full page of bibliography. (Really, no annotations? Just titles and authors to look up?) A few adventure seeds might have helped … I just got stuck on ‘tomb robbing’ and ‘going up river/down river to deliver gifts or receive tributes for pharaoh.’ I gave up on running it in college despite a few enthusiastic players wanting to play. One player was really enthusiastic about making an “Egyptian bard based on Paul Anka” so maybe it was better left un-run. For someone willing to do some research, this is actually a nice little game; the problem is that it is so different from vanilla fantasy, or from the middles ages, that it’s hard to come up with ideas that don’t feel like “so-and-so in Egypt” rather than a real Egyptian milieu. Perhaps I shouldn’t be surprised, but it is available as a pdf (rather cheaply) here. Print copies are very pricey for such a small item. The preview pages available at RPGNow are all just maps and plans, so there are no clues as the system there. At one time Palladium had if as a free download on their website, but it was taken down some time ago. I was able to find the copy I downloaded way back then, but it might be worthwhile to pay for the newer PDF since the old one was broken into sections and was just a bare-bones scan. Now that I am recalling all this, I find myself more interested in trying them out for real. I should probably check out the GURPS Egypt book while I’m at it …. Man-to-Man did not give a lot of space to developing the non-combat aspects of a character. All the skills and advantages and disadvantages were centered on combat. And yet a module was released for it (Orcslayer) that connected a series of combats with role-playing interludes. It was almost as if Steve Jackson had briefly experimented with the idea of having rules only for adjudicating combat and letting everything else be hand-waved in favor of role-playing and problem-solving, which is pretty much how we played AD&D in the early 1980s too. 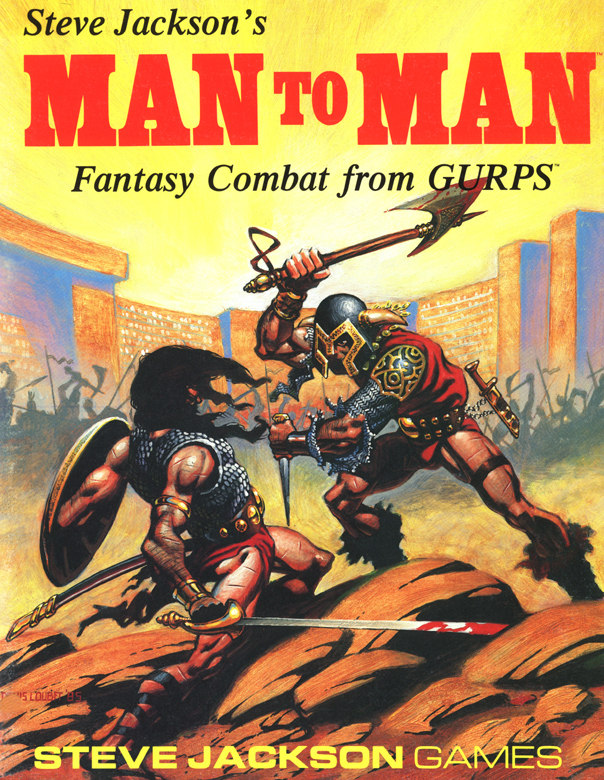 While I often mourn the GURPS second and third edition rules, which gave way to the over-complicated mess we have today, Man-to-Man is a great reminder of how simple a game it could be. In fact, looking back on Man-to-Man, I think one of the best things about it was how incomplete it was. Nothing was stopping you from adding non-combat skills and advantages, as well as disadvantages, to expand the characters. The absence of a magic system is perhaps an advantage too. The implied setting of Man-to-Man would turn into the more fully fleshed out GURPS Fantasy setting (Yrth) but if we assume that no PCs have access to magic, the game would be perfect for a swords and sorcery game pitting the player characters who must rely on wits and steel against anything the GM can dream up. Google’s Little Nemo doodle yesterday reminded me of this post I’ve been sitting on (for a month or so since I mentioned the book Dreamland), about an adventure in dreamland I ran years ago. All of these combined once led to an adventure in my short-lived GURPS Conan campaign in college. The set-up was a town or small city where the inhabitants are unhappy, drowsy, and fearful. In fact everyone within the walls is troubled by nightmares, all night every night. A great tower overlooks the city — in the original adventure the tower was outside the city but it could just as well be inside. It is of course the tower of an evil sorcerer who is stealing the dreams of the townsfolk. The adventure could involve besieging the actual tower … but the sorcerer escapes to dreamland. The party may not even realize this until they find their own dreams assailed. They will be plagued by nightmares, or robbed of their dreams entirely, and never know a good night’s sleep. The only way to stop the madness once and for all, of course, is to pursue the sorcerer into the dream realm. Certain drugs or potions will do the trick. Naturally, everything might be different in dreamland — the culture, landscape, the laws of physics and magic, the gods themselves. Maybe this is an opportunity to change systems or settings in your campaign. Maybe it’s an occasional interlude for when the DM is out of ideas, or you have unexpected absences and ‘guest’ players. Lovecraft’s dreamland stories could obviously provide additional ideas, and so do several of Borge’s fictions and essays. A GIS for maps of dreamland has some neat results too. If you have any suggestions for books or RPG supplements I should add to the bibliography, I’d be happy to hear about it in the comments. GURPS Horror, one of the early GURPS sourcebooks, has a mechanic called the “Fright check” that GMs can use to sort of enforce fear on characters. The way it works, as far as I can remember, is you see/hear/feel something scary and roll against Intelligence (plus/minus modifiers if you have advantages/disadvantages that are relevant, such as a phobia). If you fail the roll, the amount you miss by causes some involuntary reaction, ranging from screaming to fainting to puking. At the time I first saw this I thought it was pretty clever but after while it dawned on me, probably while discussing it with my brother, who has DMed D&D and GURPS and everything in between, that this is kind of a crappy idea. 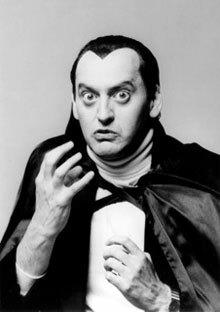 Anyway, what makes the undead scary in D&D? Why do players actually get a little scared when a mummy or wight pops out of a coffin, or a band of ghouls drop down from the ceiling? I think the obvious answer is the fact that from the earliest incarnations, D&D provided undead monsters with some seriously character-wrecking powers. Paralysis (ghouls, thouls, & ghasts), retching (ghasts), aging (ghosts), save-or-die (banshees), tomb rot (mummies), and the ever popular energy drain (wights, wraiths, specters, and vampires). Most of these have permanent consequences, or are life threatening, and your precious PC may even rise as an undead monster afterward. The horror! I wish I’d played more Call of Cthulhu so I could comment on how fear is generated in that game, but I think, at least in the first edition which I played a little, the main mechanism was loss of Sanity points, which to my mind is more like the D&D way than the GURPS way — a potentially permanent, character-wrecking mechanic that players should fear. So I guess the basic difference is you can simulate fear in characters, or actually instill some fear in the players. I’m not saying it’s got to be one or the other, but I am seriously impressed with how the D&D mechanics managed to have the consequence (intentional or not) of making the undead truly scary. In all fairness to GURPS, the Horror book also gives a lot of good advice on creating atmosphere and scaring the players too, and I should say that after D&D, GURPS is by far my favorite RPG. GURPS gets a lot of things right. These extensions still rely on having the GURPS Swashbucklers book for ship damage tables and stats for ships’ minimum crew, fire power (FP), hull ratings (HR), etc., and a Man-o-War “turning key” is needed. You can find a turning key (and all sorts of stuff) at the Yahoo Group “Sea of Claws,” although you need to join to look at the files. Our playing group was always big and we had players take the offices of Captain, Quartermaster, Bosun, Sailing Master, Master Gunner, and First Mate, some of which are referenced below. As this was fantasy, Vikings sailed in longships, and certain fantasy races had other oddball craft, like dwarf steamships and massive goblin barges. I probably have a list somewhere which I’ll post if there is any interest in these rules. Will Mistretta posted a link to a pdf of Colin de Plancy’s Dictionnaire Infernal, and I had flashbacks to the mid/late 1990’s, when GURPS was the only game I played and I was really fascinated by occultism. GURPS naturally lends itself to simulationism and the supplements for various historical periods released for the game are incredibly well-researched. GURPS Voodoo had recently been published and I decided to put my own research skills (and the Kent State University library, and the interwebs…) and interest in the occult to some effect, and create some way to simulate magic as it was thought to work … by the loonies who believe in magic. 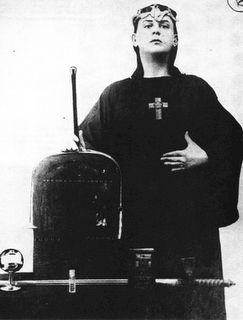 So, taking Eliphas Levi, Aliester Crowley, the Hermetic Order of the Golden Dawn, and probably most of all, A.E. 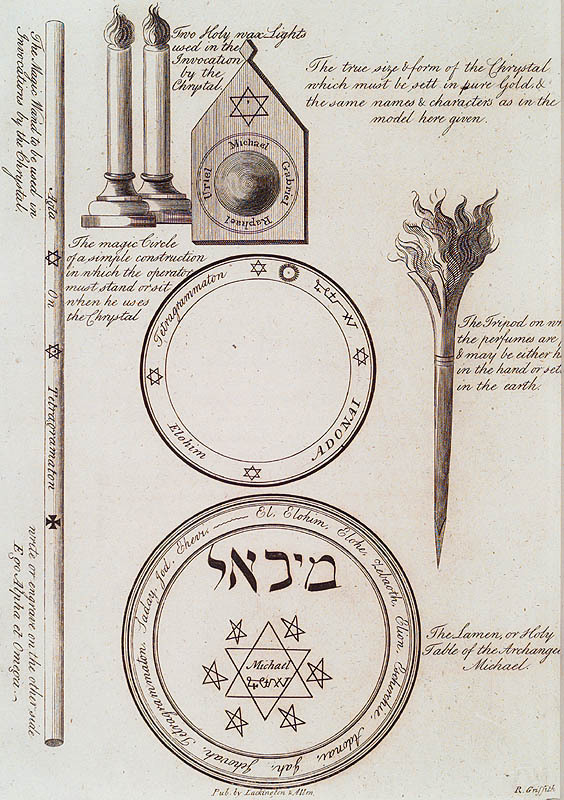 Waite‘s book on Ceremonial magic, as starting points, I tried to map the supposed grimoires of the Enlightement era onto Medieval folklore by way of the ritual magic rules in GURPS Voodoo. Just to keep things complicated, I thought it might be a good idea to make magic “styles” analogous to the martial arts styles in GURPS Martial Arts. Well, it made sense at the time. So anyway I created several documents, at least drafts, outlining how to map GURPS Voodoo onto Europe of the Middle Ages, more or less, through the lens of modern occultism. I think this is all probably made somewhat obsolete by later GURPS products (I know, for example, that Isaac Bonewits wrote a generic book on “real” magic for RPGs (called Authentic Thaumaturgy, no less! ), which at least in part covers GURPS, and although I haven’t really followed Steve Jackson Games for the last decade I have to assume they put out more ritual magic stuff in several books. Anyway, I added some images from old sources and converted the documents to pdfs, so the interested can look at the product of several misspent months here. All the pdfs should be legible is printed as digests. The one thing that absolutely kills me is that I never kept up a bibliography as I researched this stuff, although I still have a big three ring binder stuffed with articles & excerpts on demonology. GURPSRituals — a pdf of rituals for GURPS, adding Medieval stuff to the existing Voodoo rituals. At least some of these were harvested from other “fan” documents back around 1995 or 1996, and altohugh I got permission to use them at the time, I have completely lost all contact information and who to credit. I’m pretty sure I did most of the work though. GURPSBestiaryofSpirits — a pdf of spirits for GURPS Voodoo. Those intrugied by the Dictionnaire Infernal will enjoy this, as it adds dozens and dozens of demons and such from “real” grimoires. Of course no two grimoires seem to agree on just who the demons and devils are, or even what their spheres of influence are, so I tended to just add everything uncritically. I also took the infamous saint list from Bruce Galloway’s Fantasy Wargaming, so that’s pretty fun. All three pdfs should give DMs some ideas for D&D too; just ignore the GURPS mechanics which I was pretty vague about anyway. UPDATE: A link here from a GURPS site put me back on track to find I’d posted these some time back on GURPSnet and at that time I credited a poster there with the handle “Malloy” for some of the rituals and also my brother Tom who helped with most of the mechanics. It looks like “Malloy” added a TON of rituals since then! One thing that seduced many players away from D&D back in the day (at least in my experience) was the combat system. I used to frigging HATE AD&D‘s combat system. 1 minute rounds? d4+1 damage for a crossbow? Mid-level characters with 50 or more hit points, so that they take 10 or more sword wounds to kill? Of course I was occasionally persuaded that the hit points were just abstractions, as were the combat rounds and damage dice. It’s only a game, after all, right? The DMG explains at some length that one minute rounds assume lots of parrying, dodging, etc. with one real opportunity to get in a hit. But then weapons specialization, various stunts and maneuvers, and so on were added, each incrementally reducing the abstraction for me. Rolemaster was the first serious alternative to AD&D that I remember playing. That game had higher hit point totals, but assumed, IIRC, that they represented actual damage (the skill “Body development” was the only way to gain hit points) and because a character had 30 or more h.p., bleeding could be assessed at a few points per round, and so on. Most importantly, a critical hit system made many, if not most, successful hits by weapons deadly. 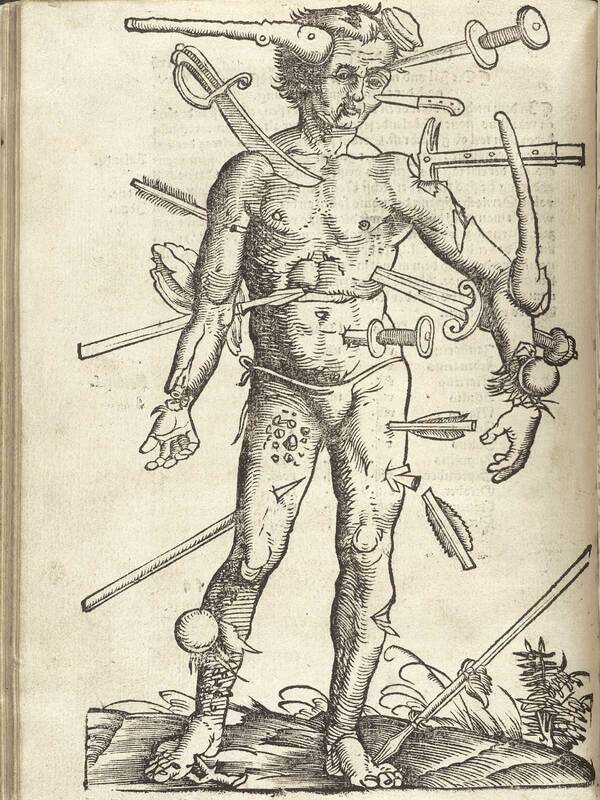 Many a Rolemaster character bled out from a severed femoral artery, or suffered shattered bones from a mace, as well as amputations, permanent nerve damage, and pretty much anything that could “really” happen when crazed orcs and dwarfs are swinging axes and swords. A round was 6 or 10 seconds, I think, and armor actually made you harder to wound, not harder to hit. Good stuff but each frikking weapon had a separate combat matrix to roll on! (A falchion was one of my favorite weapons, just based on appearance and theory, and I was really glad to see that in RM they were among the best.) When we played RM,we had to assign one player the task of keeping track of the critical hit tables, another tracked the convoluted XP system, and another mapped. It was a lot more like homework than gaming after a while. A bit later my brother & I found GURPS, beginning with the first edition, and it had 1 second (!) rounds. Weapon damage was closely tied to the wielder’s strength and whether the weapon chopped, crushed, or pierced the victim. With one-second rounds, unbalanced weapons (flails, axes, etc.) generally took a full second to recover after a swing, while swords did not, and while swords generally did a bit less damage than the hafted weapons, they were FAST. The mechanics seemed to effectively lead to realistic choices by players (yes, I’ll have all the armor I can carry if we’re going into battle, and give me a sword unless my opponent is very heavily armored, etc.). Shields were much more important than they had been in AD&D (a flat 5% bonus to defense) or Rolemaster (a 15 or 20 point bonus in a system where a percentile roll is modified by potentially huge numbers). In GURPS a shield can actively be used to block a blow, and passively may deflect a blow just by being in the way. So GURPS won the realism laurel, and we really didn’t try anything new until 3rd , 3.5, and 4th edition D&D came about. All were more tactical than AD&D or Rolemaster (and about equal to GURPS) but they retained almost all the crazy artifacts of the abstract AD&D system, grafted onto a tactical movement system that only drew more attention to how unrealistic everything else is. So I’ve actually come full circle, preferring the abstract combat of ODD or AD&D, even entertaining ODD‘s “all attacks do d6 damage” should I DM my own campaign. Right now we play C&C and I am more than happy. It turns out that realistic combat has the excellent advantage of making players more careful about when to fight, but also tends to make character death an almost unavoidable consequence of a few bad rolls. More importantly, although I’ve played many serious gamers who love the challenge of mastering complex rules, no one I game with has the time for that, myself included. Let me roll a d20 and be done with it, there’s a whole dungeon to explore! Daddy, did YOU fight in the Edition Wars? I started playing D&D back in about 1981, maybe a little earlier. I was 9, my brother was 11, as were the friends who introduced us to it. 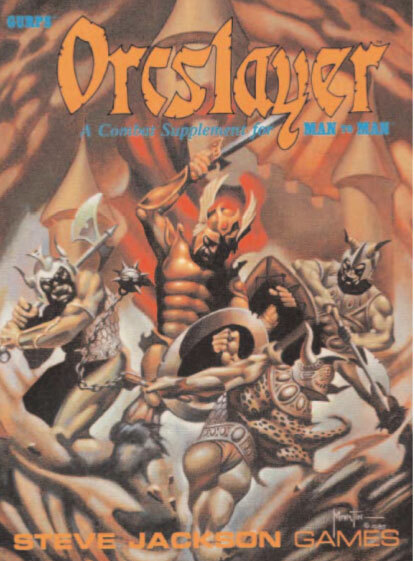 I remember the first Dragon Magazine I bought was issue # 54, and it or the following issue had a review of the “new” AD&D book, “The fiend folio,” so when I started playing D&D, AD&D was already more or less the default game. I actually tried the Basic set a little later (it was probably a Christmas present), and I vaguely recall seeing what must have been the “Holmes” revision, as our friends who introduced us to D&D had a softcover booklets that included the nine alignments, so they definitely didn’t have the “original” Little Brown Books/White Box. We were kids then and instantly assumed that “Basic” D&D was just an introduction and AD&D was the “real thing.” I don’t think we ever tried more than a session or two of the Basic set, but I did occasionally look it over for the great Erol Otus art. We played AD&D for years, snatching up every Dragon Magazine we could, and all the “Official” rule books (we never actually played with anything from Oriental Adventures, the Dungeoneer’s Survival Guide, or the Wilderness Survival Guide, but still we had to check them out). We found Unearthed Arcana a little weird, since the new classes & races seemed overpowered, but did adopt many of the new spells, rules regarding racial level limits, and fighter specialization. We still played some, but when second edition was released, D&D lost its shine. No more half-orcs, no more assassins, no more demons. Cumbersome non-weapon proficiency rules, tons of “extra” sourcebooks for character class kits and subraces. Forgotten Realms, Greyhawk, and especially Dragonlance were suddenly the “default” world for all TSR product. It became limiting. We had also been trying more “realistic” combat rules, skills-based systems, anything new. We played Rolemaster, MERP, Palladium Fantasy, Shadowrun, and mostly GURPS, actually starting with the “preview” Man To Man rules (around 1985 or so? ), which are still probably the best gladiator miniatures rules out there. In GURPS we really opened up to the wider range of genres, like the Old West, science fiction, horror, many historical campaigns including several epic “pirates” campaigns that eventually incorporated a combination of GURPS and the Man o War rules for naval engagements, cutting to GURPS “cinematic” boarding actions. (We sank many ships we should have tried to loot first, because the naval broadside rules were so fun.) We played a semi-historical campaign in Norman England but involving continued depredation by Vikings, and many supernatural elements like magic using the GURPS Voodoo ritual casting rules. I wrote a campaign history, adding each week we played, in the form of a saga, and while I never completed it, it was a blast and I still enjoy looking it over. We were really getting into games again. Then college was over and we didn’t play much. After several years hiatus, we got a 3rd edition D&D game going, and enjoyed it but saw problems, which seemed to be fixed in the 3.5 rules. But character creation had become a chore, requiring strategizing and rules lawyering. Thieves became rogues, combat machines with a few thief skills. Half-orcs were back, but as stupid barbarians, not conniving scoundrels. But role playing sessions became largely hack-and-slash combat fests, because the complex rules for combat were so central to the game. Still I loved the game for requiring miniatures, which are as big a passion for me as RPGs, obviously. We tried 4th ed. when it came out, and ran many sessions; enough to know it wasn’t what we wanted. It is a great game but it is not D&D. Just not interested in it anymore. So we’ve been playing Castles & Crusades, which is very similar to AD&D but with a much simplified action resolution system. It has been a blast. The energy we haven’t had to expend learning rules has gone into character backgrounds, session summaries, etc. Our DM, my brother, keeps a log on a calendar. I haven’t gotten a close look but I think events we players don’t know about are also on that calendar. That is cool. We use figures like we did in AD&D — to show marching order, to make melee more concrete, and to show off my painted figures. I am seriously considering running an original rules D&D campaign, or perhaps a retroclone, or just C&C. I have a lot of war-gaming figures, so I’d probably work in opportunities for the players to take part in tabletop miniatures battles at times. I have a ton of ape-men, including a HOTT army of them, so there will probably be an Ape kingdom. I’d love to run a siege — a friend of mine built a 25 mm scale castle out of matte board, pretty much identical to the castle Games Workshop was selling when they released their first Warhammer Siege rules in the late 1980s. I painted it and built some siege equipment, and I have never gotten around to using them for siege! I have tons of monsters I’d like to put in dungeons, and am thinking about assigning a particular NPC to each of my “townsfolk” and “henchman/hireling” figures. I have ideas about a hexcrawl for wilderness adventures, and as part of uncovering & creating the world map. Possibly in Hyborea, or a similar pastiche of fantasy/adventure archetypes. My brother, the group’s current DM, has said he’d like a break from DMing anyway, and perhaps it would run parallel to the current game, or something like that. If I have the time. There’s a lot of figures to paint.